Transcript of remarks for the panel "Why Translate?" Sharing might just be with myself, as in a diary entry, or with a cadre of of loyal readers and any Internet surfers who happen onto my blog. Sharing ramps up, of course, when we start talking about books. People have many different and varied motivations for writing and publishing books and for some, one of them is nothing less than to change the world. Or maybe, to change our understanding of some aspect of the world and so change the world. 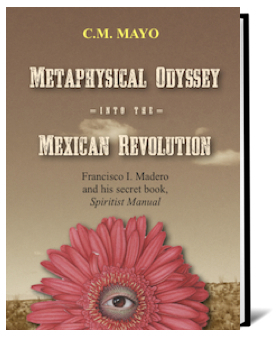 Francisco I. Madero intended his Manual espírita to be a beam of light, to heal Mexico and the world with his consoling concepts of the nature and meaning of life. However, it is a book that stands on the shoulders of his first book that was, indeed, a loaded gun: La sucesión presidencial en 1910, published in the winter of 1909 when Don Porfirio Díaz, the dictator who had stolen the presidency in a coup détat and ruled Mexico on and off for over thirty years, was about to celebrate his eightieth birthday and, as Mexicos so-called necessary man, take for himself a seventh term. "[T]he first precaution I took was to hand out 800 copies to members of the press and intellectuals throughout Mexico, so when the Government got wind of the books circulation, it would be too late to stop it. . ."
Now when we come to Madero's second book, Manual espírita, or Spiritist Manual, there are two reasons the subtitle of my book calls it his "secret book": First, he wrote it under a pseudonym; second, incredible as it may sound, for the most part, historians have ignored it. A few have begrudged it a footnote; only a very few so few that I can count them on one hand have dared to write about it in any depth and seriousness. In 1911 five thousand copies of Madero's Manual espírita went into circulation, one assumes, among Spiritists. It was reprinted in part by Madero's enemies, the Reyistas, as an attack their message being, "Madero is the true author, you see what a nut he is." And I discovered that in 1924 Casa Editorial Maucci in Barcelona brought out a reprint (print run unknown). I do not know what influence the Manual espírita may or may not have had in spreading Spiritism, whether in Mexico or abroadit would make a fine PhD dissertation to delve into that question but as far as historians of Mexico are concerned, until very recently, and apart from a very few and very hard-to-find editions published in Mexico, essentially, the Manual espírita disappeared into the ethers. In our day, what we think of as self-publishing usually includes intermediaries such as amazon.com. In my case this would be amazon.com and Ingram. Ingram's recent move into the realm of self-publishing is really the topic for another panel, but suffice it to say that for traditional publishing, no exaggeration, this is as momentous as Hiroshima. Ingram is a major book distributor and now also an on-demand book printer, and what listing with Ingram means is that all major on-line booksellers can now, on demand, easily source that self-published book. Libraries can order it, just as they order many of their books from Ingram, and while Barnes & Noble as well as many other major bookstore chains and independent bookstores may not necessarily stock it on their shelves, it's right there, as easy to order as any other book, on their webpagesagain, sourced from Ingram. Will my book with its translation of Madero's Spiritist Manual change our understanding of Mexican history? Well, I do think it blasts the sombrero off the reigning paradigm, to consider that Francisco I. Madero, the leader of Mexico's 1910 Revolution an absolutely transformative episode in Mexican history and the first major revolution of the 20th centurywas a not only a Spiritist but a leading Spiritist and a Spiritist medium. It is also then my aim to deepen our understanding of the 1910 Revolution and therefore of Mexico itself, and because the histories are intertwined, therefore also deepen our understanding of North America, Latin America, the Pacific Rim, and more for as long as a book exists, should someone happen to read it, it can catalyze change in understanding (and other changes) that ripple out, endlessly.